Soak beans in 2 c water for several hours, or overnight. Place in slow cooker and cover with 4 c water. In a skillet ( I used the cast iron skillet I had just used to fry bacon for breakfast), cook ham hock on med heat , turning frequently, until it begins to sizzle. Remove and place in slow cooker. 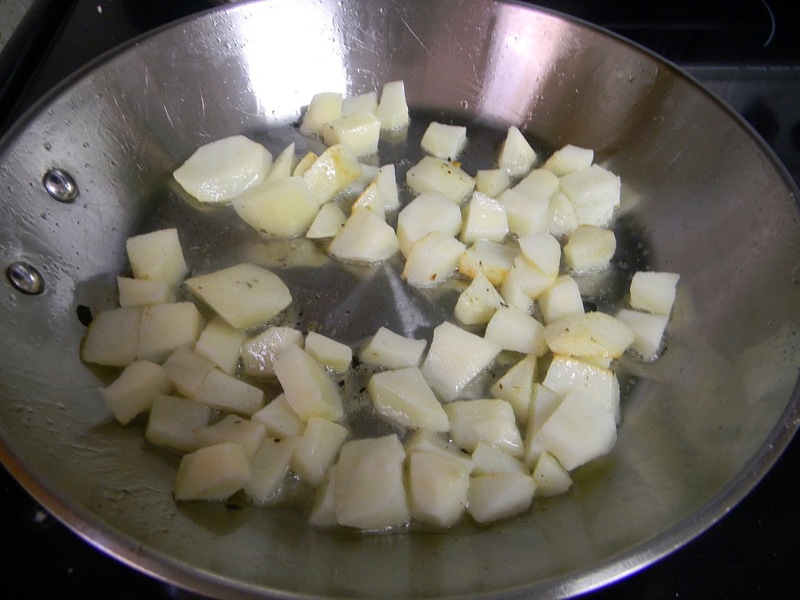 Put the Recaito, onion, and garlic into the skillet and cook on low for 3 minutes, stirring frequently. Pour into slow cooker over beans. Add remaining ingredients and cook on low 8-9 hours. This entry was posted in Adobo, GARLIC, Goya, Puerto Rican, Recaito, slow cooker on October 28, 2014 by theselftaughtcook. In a medium-size pot or caldero, heat EVOO. 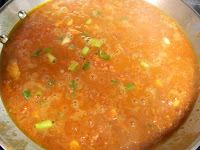 Add Sazon, Adobo, garlic, tomato sauce, green pepper, recaito, olives, capers, and onion powder. Saute over medium heat for two minutes, stirring frequently. Add chicken stock and bring to a boil. Return to boiling, stirring frequently. Lower heat; allow rice to simmer slowly until tender. 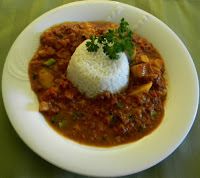 This entry was posted in Adobo, bell pepper, chicken, extra virgin olive oil, GARLIC, Goya Adobo con Pimiento, Goya Sazon con Culantro Y Achiote, Puerto Rican, Recaito, RICE, Sazon, Spanish-style tomato sauce on August 21, 2014 by theselftaughtcook. Once again, I am reposting a favorite recipe of ours. This is something I cook quite often, and I hope you will like it as well as we do. Adapted from "A Taste of Puerto Rico: Traditional and New Dishes from the Puerto Rican Community"
In a mortar, crush the garlic. Yes, in a mortar. It just won't be the same if you use a food processor. Add the adobo, olive oil, and vinegar; mix well. Pour mixture over pork chops; marinate in refrigerator from 30 minues to overnight. Heat the vegetable oil in a skillet. Fry chops with garlic until golden brown. Add as many additional garlic cloves as you like. I add at least 8 more. You can serve this with anything you like, but I serve it with Arroz Amarillo (Yellow Rice) and Tostones con Mojito de Ajo (Twice-Fried Plantains with Garlic Sauce). Dee-lish! This entry was posted in Adobo, GARLIC, Goya Adobo con Pimiento, pork chops, Puerto Rican on September 5, 2013 by theselftaughtcook. 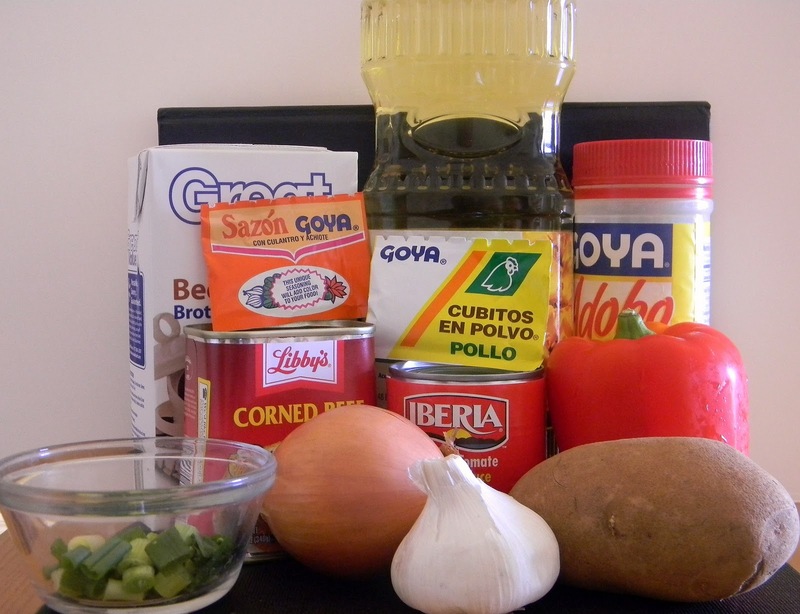 One of the first and simplest Puerto Rican recipes I learned to cook was corned beef and rice. I admit, it’s high in sodium, so I don’t advocate eating it every day, but every now and then, it is soooo good! I quit measuring for this a long time ago, so I had to slow down and pay attention to what I was doing this time. Fry chopped potato in canola oil. Remove from pan; drain on paper towel. Add onion, garlic, pepper, and seasonings to pan. Cook 3 minutes, stirring frequently. Add tomato sauce and beef broth; bring to a boil. Add corned beef; lower heat to simmer. It will probably be necessary to break up beef with fork. Cover and cook at least 15 minutes. Stir in potato and green onion; cook additional 5 minutes. Remember the tostones and garlic sauce? Serve with the corned beef and rice…..Que bueno! “… the search for approval and applause moves all men.” Santiago Ramón y Cajal, Los tónicos de la voluntad, 1912. This entry was posted in Adobo, Puerto Rican on September 4, 2013 by theselftaughtcook. According to Wikipedia, the term Hispanic is used to denote a link to Spain, whether it is a culture or a group of people. This is why the people of the countries and islands who were once ruled by Spain are labeled Hispanic today. As these geographical locations encompass a large variety of customs, traditions, cuisines, and music/art forms, the Hispanic community is a diverse group which cannot be limited to a stereotype. Of course, my bias tends to lean toward Puerto Rico. The fact that SuperHubby is Puerto Rican couldn’t have anything to do with that, could it? ;) Over the past eleven years, I have learned a lot about that beautiful island and its people. In case you didn’t know (and I’m always amazed at how many do NOT know), Puerto Rico is a commonwealth of the United States. Puerto Ricans are U.S. citizens by birth, just like people from Connecticut, Tennessee, Utah, etc. They do not need a “green card” or a passport to travel, live, or work in the continental United States. Okay; I’ll step down from my soapbox now…. Now, if you’ve been reading my blog over the past couple of years, you are aware that I cook a lot of Puerto-Rican influenced cuisine on here. In honor of Hispanic Heritage Month, I am reposting one of our favorite recipes here. One of the first things I learned to cook is Puerto Rican style yellow rice. It is a basic dish, and varies slightly depending on the cook. Usually, I just “eyeball” it, so when I decided to post this recipe, I had to stop and measure the ingredients as I cooked. Again, this is one of those things that can vary according to your tastes, so don’t get too hung up on being exact. To effectively cook rice, you need to find just the right pot in which to cook it. I use a caldero, which is the traditional cooking pot used for cooking rice and other foods in Puerto Rico. Basically, it's a Dutch oven. Add the next 7 ingredients. When the water comes to a boil, add the rice. Turn the rice down to low. When the water has evaporated until it is level with the rice, add the ham and alcaparrado, stir once, put the lid on and turn heat as low as possible. Let rice simmer approximately 20 minutes. Now, you don't want your rice to be too wet. This should not be a sticky rice; but, of course, you don't want it to stick and burn. The only way this will work is to LEAVE THE RICE ALONE!! This is very difficult for me. My usual approach to cooking is to hover over the stove, checking, stirring, sometimes even praying. With yellow rice, you can't do this. Well, you can pray, but you need to do it from a distance. I have learned that when I turn it down and put the lid on, it's best to just leave the room. Really. You have to do this. Now, as for alcaparrado, it is a combination of olives, capers, and pimentos. If you can't find it in your store, don't sweat it; just use pimento stuffed olives. If you can't find the packets of chicken bouillon, again, don't worry. Just use a chicken bouillon cube. It's basically the same. This entry was posted in Adobo, Goya, Goya Adobo con Pimiento, Goya Sazon con Culantro Y Achiote, Puerto Rican on September 1, 2013 by theselftaughtcook.